Two rooms with air conditioners, vents and shared bathroom with shower & hot water. This house has a yard and a terrace, where you can find tables and chairs. Surrounding the yard area there are ornamental plants and trees, where you can sun-bathe, dine or take a rest. 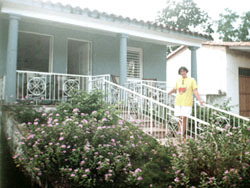 The house is located at 160m from the town’s center and 200m from the bus station (Viazul).